26 October 2017 – Bahrain’s High Court of Appeals has today confirmed the asset seizure and dissolution of Wa’ad (also known as the National Democratic Action Society), the country’s largest secular, leftist opposition group. Wa’ad was the last major opposition group officially operating in Bahrain following the July 2016 dissolution of Al-Wefaq National Islamic Society. 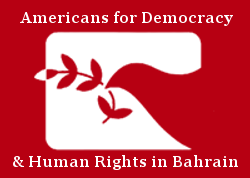 Americans for Democracy & Human Rights in Bahrain (ADHRB) reiterates its total condemnation of the arbitrary decision to dissolve Wa’ad and calls on the Government of Bahrain to immediately end its attack on peaceful political opposition. The government took similar action against Bahrain’s largest political group, Al-Wefaq, on 14 June 2016, when a Bahraini court approved the society’s suspension within hours of receiving a request from the MOJ. Authorities immediately enforced the order, freezing the group’s assets, blocking its website, and closing its headquarters. On 17 July 2016, after the judiciary expedited the legal proceedings, Bahrain’s High Civil Court affirmed the order and formally dissolved Al-Wefaq. The second High Civil Court of Appeals upheld the dissolution on 22 September. Al-Wefaq’s Secretary-General, Sheikh Ali Salman, is currently serving a four-year prison sentence stemming from a political speech he delivered. The government dissolved another opposition political group, Amal, in 2012, and it is currently incarcerating Fadhel Abbas, the leader of the smaller leftist society Al-Wahdawi, on charges related to tweets. This is also not the first time that Bahraini authorities have targeted Wa’ad and its members. The society’s headquarters was twice attacked and it has repeatedly faced suspension or threats thereof. Bahraini authorities have continuously subjected its former secretary-general, Ebrahim Sharif, to various forms of judicial harassment. On 20 March 2017, officials charged Sharif with “inciting hatred against the regime” and against “factions of society” under articles 165 and 172 of Bahrain’s penal code for messages he wrote on social media. Sharif was previously imprisoned from 2011 to 2015, and then again from 2015 to 2016 on similar charges stemming from his involvement in the pro-democracy movement and speeches he delivered. He could now face up to three more years in prison. Other Wa’ad leaders, including Sharif’s wife Farida Ghulam and former secretary-general Radhi al-Mosawi, have also faced regular judicial harassment, including recent arbitrary travel bans. With today’s ruling approving the dissolution of Wa’ad, the Government of Bahrain has confirmed its intention to close all space for formal political opposition. ADHRB calls on the Government of Bahrain to immediately reinstate dissolved opposition groups including Wa’ad and Al-Wefaq, unconditionally release all political prisoners, and lift all restrictions on free expression, association, and assembly.